Well, not only did the International LGBTQ Leaders Conference highlight LGBTQ veteran candidates currently running for office, such as Gina Ortiz Jones, candidate for TX-23 and U.S. Air Force Veteran, but it also included LGBTQ elected leaders who are having a meaningful impact on veteran policies in Congress, such as Mark Takano – Vice Ranking Member of the House Veterans Affairs Committee. Additionally, as part of the of this year’s conference, former Houston Mayor Annise Parker, the first openly LGBTQ person ever elected mayor of a major U.S. city, was announced as the new President and CEO of Victory Fund and Victory Institute. During her time as Mayor of Houston, she rolled out programming to effectively end veteran homelessness, making Houston the largest city at the time to do so. The work being done by Victory Institute and Victory Fund, shares a similar model with organizations in the veteran space such as the newly launched organization, With Honor, whose mission is to help elect principled next-generation veterans to office who will work in a cross-partisan way to create a more effective and less polarized government. Organizations like these are working to elect leaders who give voice to underserved populations that allow for a much more representational and diverse democracy. Veterans, as well the LGBTQ community, intersect the exact same populations, and highlight just how multifaceted we are as humans and as leaders. As the famous line goes, which I’ve heard attributed to far too many individuals for me to feel comfortable enough to provide you with a single source, “If you’re not at the table, then you’re on the menu.” This highlights the importance of having a representative of your community as part of the policy making process – one who knows and can give credible voice to the unique influence of some of those intersectional populations that are often disproportionally impacted. This is particularly relevant for this intersection on the military and LGBT community, as we now operate in a post-DADT space and, as of Jan. 1, the military can begin accepting transgender recruits in spite of the Trump Administration’s efforts to both block and delay those efforts. In a recent Scout Insight survey, veteran community leaders overwhelming support the military service of transgender troops, with 85 percent of respondents agreeing that if a transgender person meets all current physical, mental and security standards, he or she should be allowed to serve openly. Leaving conferences of this type are always bittersweet, as you’ve just spent several days learning and growing and being around a community of folks who get it. During my time at Student Veterans of America, we called this the “NatCon High,” where you leave the conference inspired and even more committed to the mission. 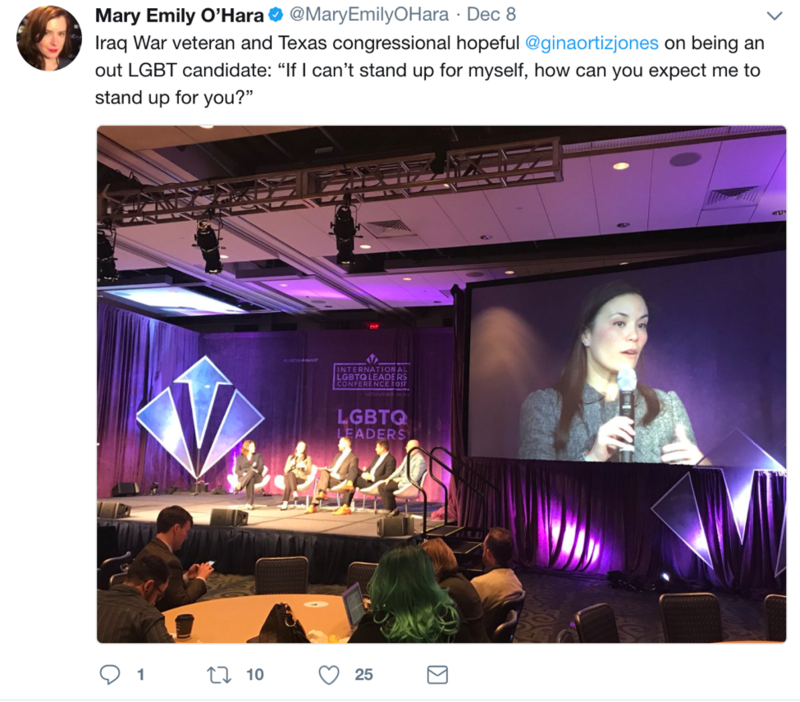 The final plenary of last weekend’s conference was “Year of the Trans Candidate,” which featured a panel that touched on the string of recent successes of transgender candidates at all levels of office and also highlighted not only their trans identity but the other intersections and lived experiences that they bring to the table. You see this same engagement and leadership in the veterans space, particularly among younger veterans. SVA’s upcoming #NatCon2018 in San Antonio will feature the session, “Identity Intersectionality: Veterans and the LGBTQIA Identity,” demonstrating that not only are LGBTQ people engaged in all communities, but they are becoming the leaders of tomorrow.